Highly-fortified textured ration for confined deer designed to meet the extra nutritional demands of high scoring bucks during antler development.The protein content supports top performance with patented AntlerMax® Technology. This diet is also uniquely designed to supply extra nutrition to deer during their life stages when nutritional requirements are accelerated: does during lactation; does and bucks regaining body weight after the rut; and deer regaining body condition following periods of reduced intake due to climatic factors or illness. It is also an excellent creep and weaning ration for fawns. ANTLERMAX® PELLETS, PATENTED ENERGY NUGGET, CRACKED AND WHOLE GRAINS - For development of improved antler size and mass. New and improved formula provides for a high intake of high-quality proteins including AntlerMax® By-Pass Protein technology that deliver high concentrations of amino acids needed by the growing antler. Helps develop deer with exceptional body size. High- quality protein helps build muscle for improved body growth. HIGH FAT CONTENT - 6.0% fat from several high- quality vegetable oil sources including a patented high energy nugget that helps deliver a high percent of fat directly to the growing tissues. Helps deer regain body condition quickly. ENHANCED LEVELS OF VITAMINS AND MINERALS - Helps promote antler growth, density and strength. Enhanced levels of calcium, phosphorous, magnesium and vitamin D. Contains proprietary AntlerMax® Mineral Technology including organic trace minerals for replenishing depleted bone material stores used during antler mineralization. TASCO® DRIED KELP - Excellent source of iodine and other minerals. Research done with several livestock species has shown that body temperature is lower in animals fed TASCO®. May help maintain feed intake during periods of heat stress. DIAMOND V® YEAST - Help improve feed intake and digestibility – Diamond V has conducted research with deer that demonstrates that under some conditions feed intake and forage digestibility were improved with the addition of Diamond V® Yeast. 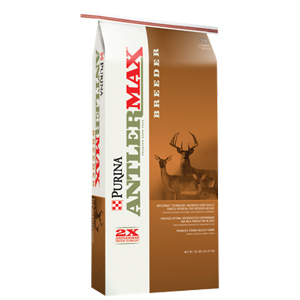 ANTLERMAX® DEER BREEDER TEXTURED 17-6 FEED is a highly fortified textured ration for confined deer designed to meet the extra nutritional demands of high scoring bucks during antler development. This diet is also uniquely designed to supply extra nutrition to deer during their life stages when nutritional requirements are accelerated: does during lactation; does and bucks regaining body weight after the rut; and deer regaining body condition following periods of reduced intake due to climatic factors or illness. It is also an excellent creep and weaning ration for fawns.